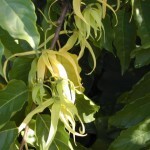 Ylang-Ylang Tree (Cananga odorata) - Richard Lyons Nursery, Inc. If you haven’t discovered the source of Chanel No. 5 perfume, allow us to introduce you to the Ylang-Ylang Tree. Native from island chains of Southeast Asia into northern Australia, this tropical evergreen produces oils that are steam-distilled from its aromatic flowers to create the world-famous women’s fragrance. The story goes that Russian-born perfumer Ernest Beaux presented French coutourier Coco Chanel a series of sample fragrances in 1920. The fifth sample piqued her interest, and because of the coincidence that her clothing line was introduced on the fifth day of the fifth month every year, she dubbed the new product Chanel No. 5. Its major component is the oil of Ylang-Ylang (pronounced EE-lang – EE-lang), augmented by oils of a jasmine and a rose. Ylang-Ylang (Cananga odorata) belongs to the Annonaceae family, which includes custard-apple, sugar-apple and soursop. On drooping branches it produces greenish flowers that mature to chartreuse shades and eventually to a fairly dark yellow. In warmer months in southern Florida, its heavenly fragrance permeates the evening and nighttime air for a significant distance. Where it is native, the fast-growing C. odorata can reach 100 ft., but in the thin soils of our region, mature heights of 30 ft. are the norm. This species is amenable to exposures from full sun to light shade, and in placing the plant, we recommend a site where other trees provide a wind break. 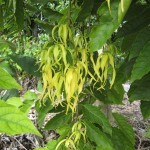 Some medicinal uses, including aromatherapy, are attributed to Ylang-Ylang. It is also said that in Indonesia, the tree was historically valued as an aphrodisiac, its flowers strewn about the beds of newlyweds. We here at Richard Lyons’ Nursery suspect that providing an aphrodisiac to the newly-married is like carrying coals to Newcastle. 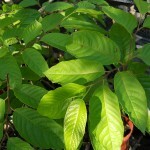 But no matter what use you have in mind for Ylang-Ylang, you will find it available at the nursery in 1-gal., 3-gal. and 15-gal. sizes.